Disk Protector Suite by Acronis is a partition management software for running and installing multiple operating systems, recovering accidentally deleted disk partitions combined with a suite of disk management tools. 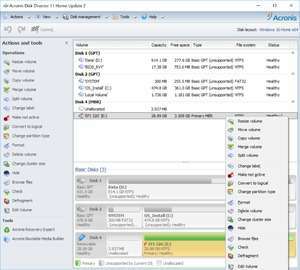 Acronis Disk Protector Suite can manage, view and edit hard drive partitions such as FAT32 and NTFS. It includes tools to clone, copy, merge and defragment partitions along with quick links to other optimizations tools. This software also includes the previous functions of Partition Magic, allowing users to split and join hard drive partitions with ease; Installing a second operating system such as Linux has never been easier beginning with your Windows desktop. Acronis Disk Director Suite 11.0.2343 is a shareware program and can be used as a demo to try the software until the free trial period has ended. A full version of the program is available after the trial period ends. For security reasons, you should also check out the Acronis Disk Director Suite download at LO4D.com which includes virus and malware tests. Additional screenshots of this application download may be available, too.